As you all know, for the first time in many years, our university-wide spring commencement ceremony had to be cancelled on account of dangerous weather. All of our college and school graduation ceremonies took place. And we convened a small ceremony inside the Main Building, where our keynote speaker, Darren Walker, delivered an inspiring address for our graduates to watch online. You can watch or read his speech here. Josh Aldred is receiving his PhD in civil and environmental engineering from the Cockrell School of Engineering. Josh studied the benefits of using activated carbon air filters to improve health in buildings. By collaborating with UT Austin Environmental Health and Safety on improvements in one campus building, he was able to cut indoor ozone levels by nearly half while simultaneously saving $50,000 a year. This strategy might be used in new campus construction such as the Engineering Education and Research Center and the Dell Medical School. Josh is also a major in the Air Force and has been deployed in Afghanistan, Qatar, Oman, and Iraq, where he led a work-training and education mission called The Village of Hope, teaching young men who were former militants to read and do basic math. Josh is headed to Korea this summer for a one-year tour and then plans to teach civil engineering at the Air Force Academy. Thank you, Josh, for all you’ve done, and congratulations! 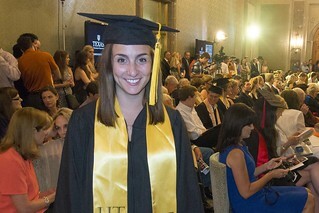 Brianna Connelly earned a degree in computer science from the College of Natural Sciences. Bri led a team of 13 students in the IBM Watson competition to win $100,000 in seed funding. They used the money to develop an app that uses artificial intelligence to help Texas residents find health care, food assistance, and other social services. That class project has now become a company, and Bri, who was the only female in some of her computer science classes, is the CEO. She was an officer in the Women in Computer Science organization and helped found what is probably the first co-ed computer science fraternity in the country. She also was a member of the prestigious Turing Scholars program. She starts this summer as a product manager at Google. We’re looking forward to watching your success. Congratulations, Bri! Ten years ago, on the night of August 13th, 12-year-old Esperance Nasezerano of Congo and her family were huddled in a U.N. refugee camp in Burundi when armed soldiers began shooting and setting fire to the tents in which they were sleeping. One hundred sixty-six people died that night in front of her, and Espy herself was shot in the back. She recovered from her injury, and two years later, her family moved to the United States and settled in Fort Worth. She began learning English at 16, graduated high school, and enrolled in a community college. 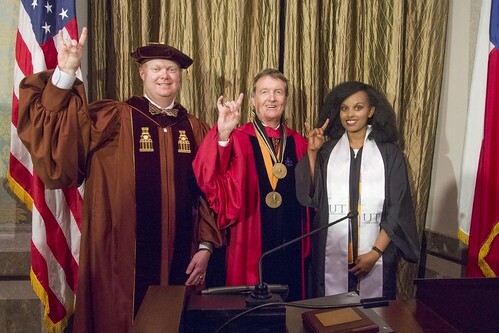 As a junior, she transferred to UT. Here, she majored in international relations and global studies in the College of Liberal Arts and worked in our International Office. Espy has seen the worst of humanity, but she lives with optimism. She wants to attend graduate school and then work for the U.N. in human rights advocacy. Espy says, “I am just so thankful to God and America for giving me a second chance to live again and have the opportunity to do things that most of my friends will never have the chance to do.” Esperance, you give us all hope for a brighter future. Congratulations! Like Josh, Bri, and Espy, each of our graduates has a unique story. But they all share the common experience of being graduates of one of the finest institutions in the world, The University of Texas at Austin. You can find more profiles of our outstanding new alumni here. I hope all of you were able to be with your loved ones and celebrate graduation in your own special way. Our thoughts and prayers are with those throughout Texas who are recovering from the extraordinary weather of the past week.